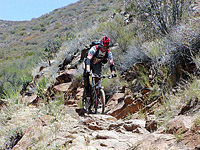 Noble Canyon is considered to be one of the best trails around Southern California. 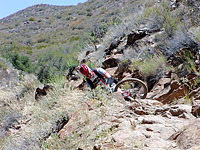 It is technically difficult with narrow single track, gnarly rocks and tight switchbacks. 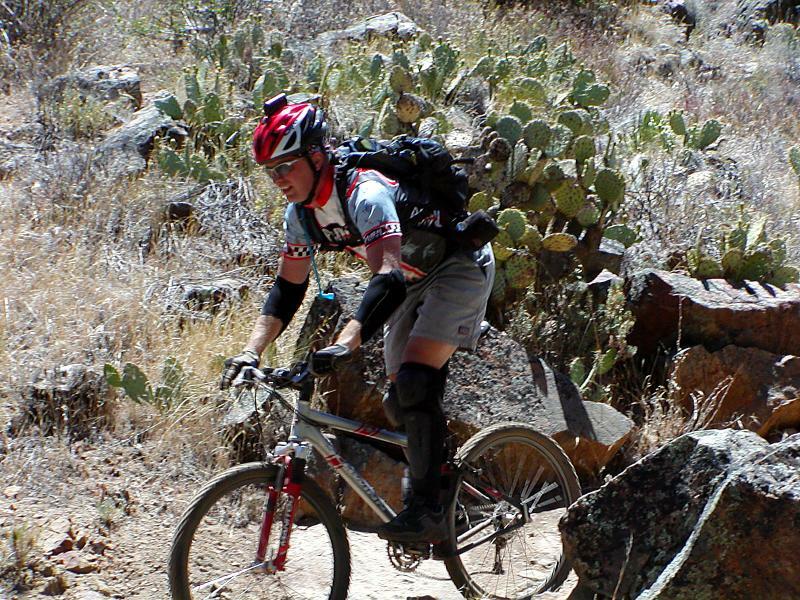 This ride takes you through three distinct ecosystems. 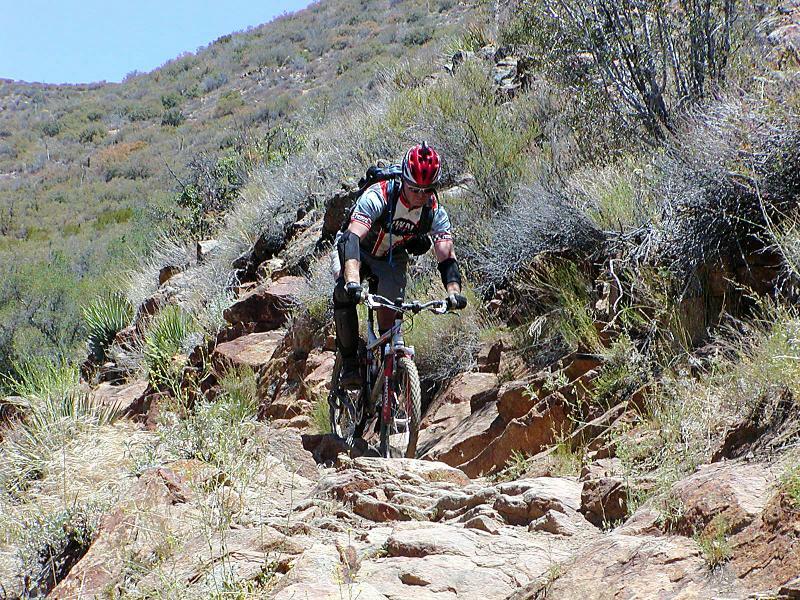 You start out in alpine meadows and oak trees that transitions into typical Southern California chaparral and finally into the arid desert climate near the Anza-Borrego desert. 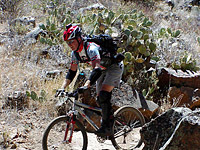 At some times of the year you can start the ride will plenty of snow on the trail and by the end of the ride be in 85 degree desert heat. This is normally considered an advanced ride. This ride will be fun for intermediate riders but you will most likely find yourself doing some walking over and down obstacles. To the left is a PDF map of the ride . Here is the elevation profile for the ride. Directions: There are several ways to do Noble Canyon. You can certainly do to the shuttle thing and start at the upper trailhead on Sunrise Highway. 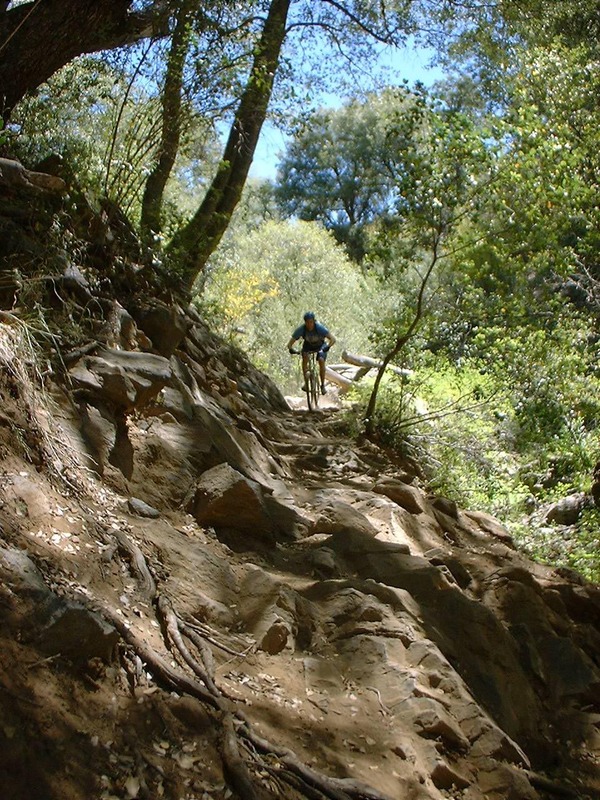 You can start at the lower trailhead at the Pine Creek Picnic Area and have yourself a really a really good climb up Deer Creek Road and Laguna Meadows Road to get to the upper trailhead and then go down Noble, Or you can do the Laguna Noble ride I describe here. The map here and the description should be enough for you to do what ever variation you desire. 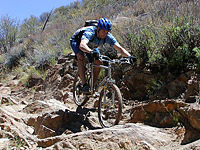 A National Forest Adventure Pass is required at the Upper Trailhead and the Lower Trailhead as well. 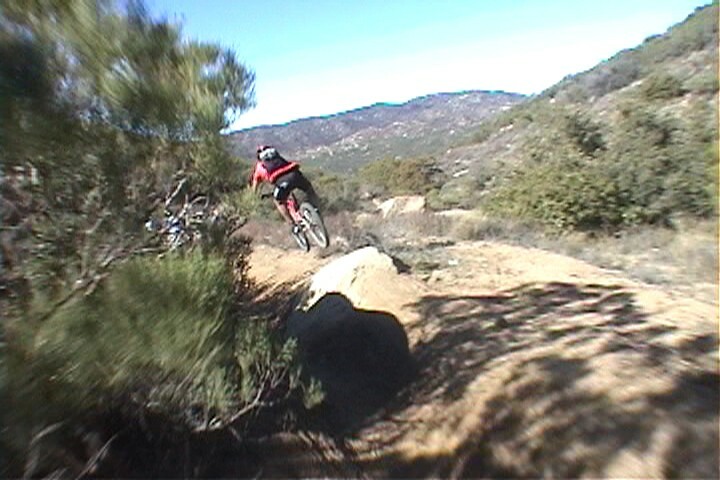 For the Laguna - Noble combination ride: From San Diego, take I-8 east to the off ramp for Pine Valley. Exit the highway and turn left. Travel north for .3 miles to Old Highway 80. Turn right and travel about .3 miles and you will see the General Store on your left. Park the shuttle car parking lot. With the other vehicle, continue on east on Old Highway 80 to the intersection on Sunrise Highway. Turn left and go up the hill. About 1/2 mile after entering the Laguna Recreation Area you will see a Wildlife Information Kiosk off the right side of the road. Park somewhere along the side of the road here. To just shuttle Noble Canyon: From San Diego, take I-8 east to the off ramp for Pine Valley. Exit the highway and turn left. Travel north for .3 miles to Old Highway 80. Turn right and travel about .3 miles and you will see the General Store on your left. Park the shuttle car parking lot. With the other vehicle, continue on east on Old Highway 80 to the intersection on Sunrise Highway. Turn left and go up the hill. About 6 miles after entering the Laguna Recreation Area you will see the Penny Pines/Noble Canyon trailhead parking area. Park here. If your are going to climb up from the lower trailhead: From San Diego, take I-8 east to the off ramp for Pine Valley. Exit the highway and turn left. Travel north for .3 miles to Old Highway 80. Turn left onto Old Highway 80 and travel about 1.2 miles to Pine Creek Road. Turn sharply right onto Pine Creek Road and travel 1.6 miles to the trailhead parking on the right. Hazards: Treacherously technical trail with steep drop offs just off the trail. This is not a place to try to bring a beginner. This place can get really hot in the summertime and the lower portions are very exposed. 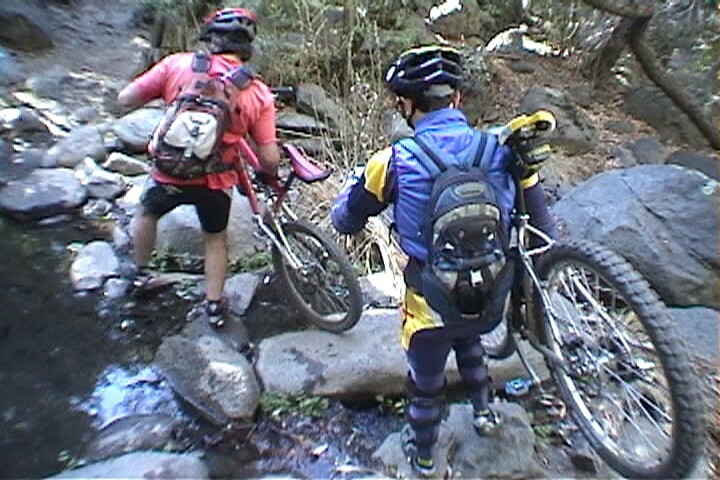 We normally do this ride as part of a Laguna Noble Combination ride that I describe below. 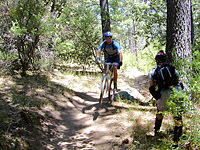 For this ride we left a vehicle in the parking lot of the General Store in Pine Valley and then driving up Sunrise Highway into the Laguna Recreation Area and then do 12 mile or so XC ride trough forests and wide meadows that takes us to the upper trailhead of Noble Canyon. 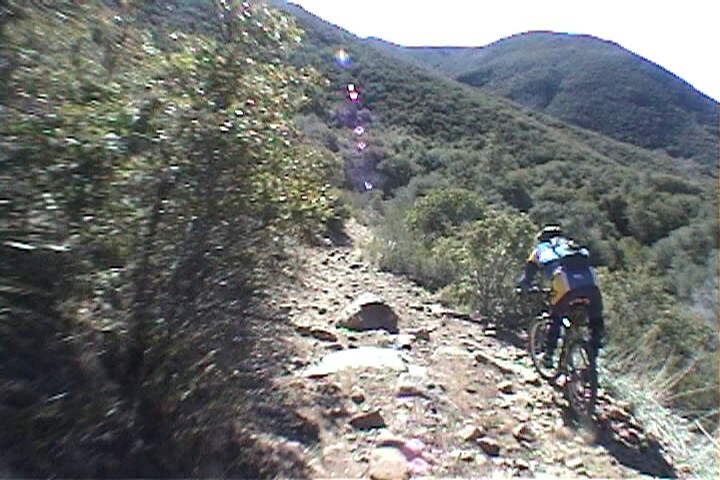 Then we head down Noble Canyon. About a mile before the we get to the "traditional" bottom of Noble Canyon we take a trail off to the left and make our way into Pine Valley and ultimately to the General Store. I don't think of this as a shuttle monkey route but a point-to-point shuttle route. 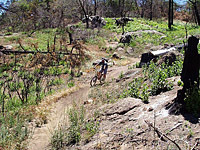 This ride report picks up at the Upper Noble Canyon trailhead. The upper Noble Canyon trailhead parking area. There is a water faucet beside the trail just below the trail head. 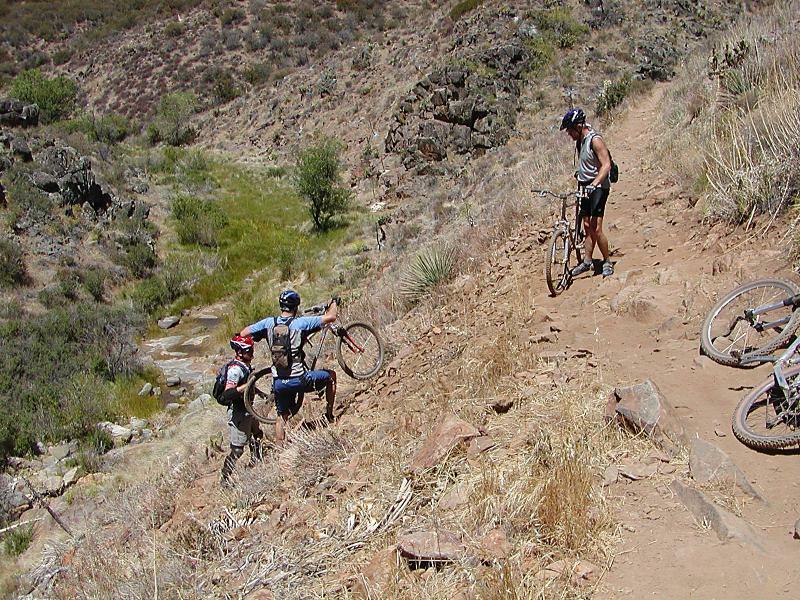 Make sure your water is topped off before you head out down Noble Canyon. offers a stunning view of the Anza-Borrego Desert below. 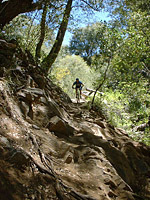 The upper Portion of Noble Canyon offers some smooth rolling single track and a short gradual climb before the descending starts. 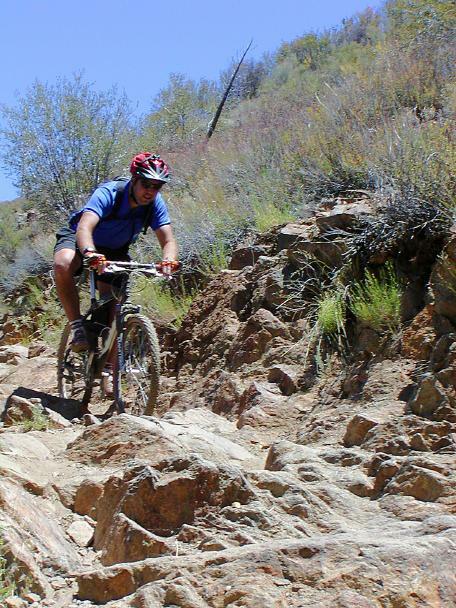 You will cross Pine Creek Road a couple of times as you head down Noble Canyon. Also you will pass the junction of Indian Creek Trail that will take you out to to Cuyamacas. 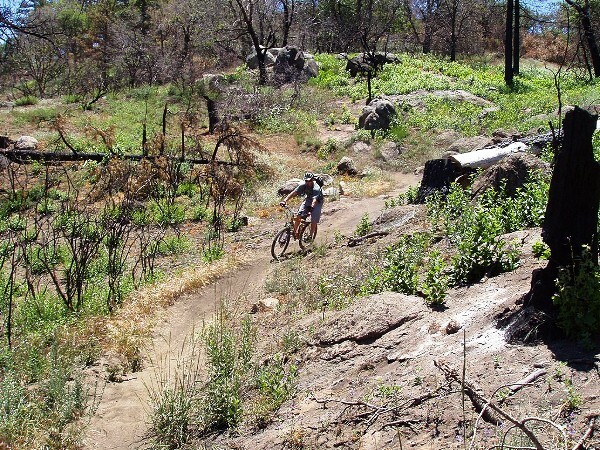 You can use this trail to do a truly epic Cuyamaca to Noble Loop. After descending for some time along the fast smooth stuff you will come to a horse gate. At this point you are probably be thinking to yourself "What is the BIG deal? The is not technical at all" Beyond this point the trail changes dramatically. 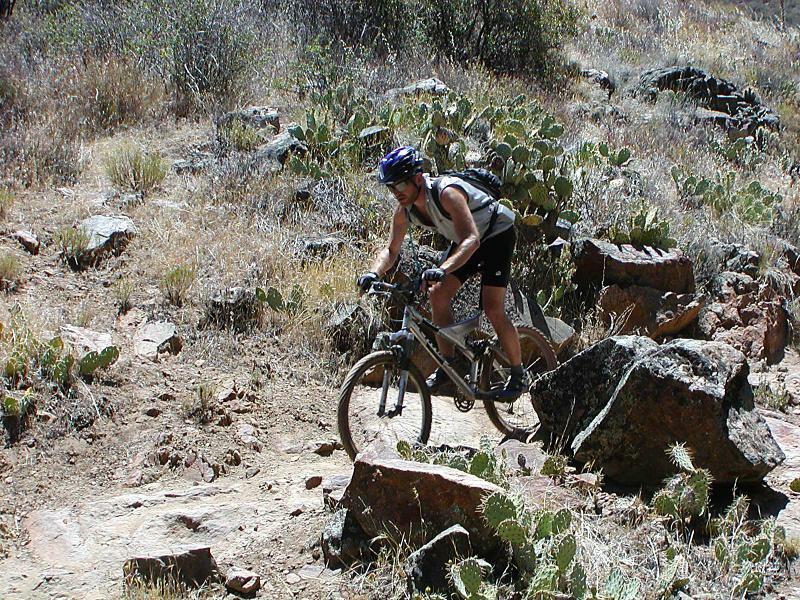 Just after the gate you will a have to navigate some tight switchbacks and the terrain starts changing from forest to chaparral. 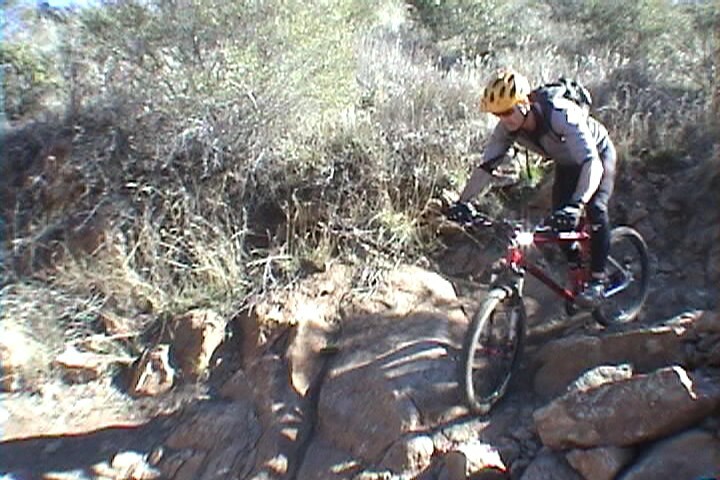 Also the trail starts get rockier and more technical. 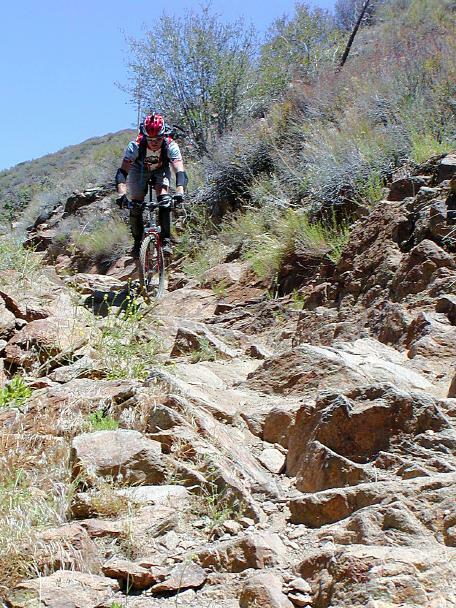 At the first dry creek crossing is where you encounter the first really technical rocky outcropping. (Upper left above you can see Collin working this section.) 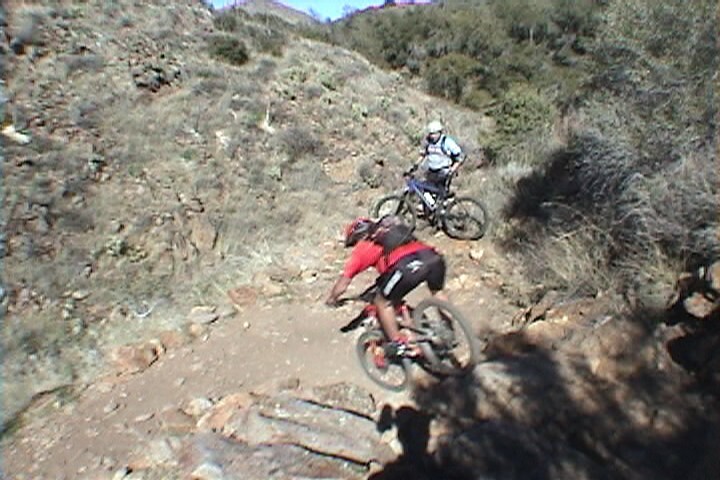 After this section you have a long descent that is packed with drops and rocks that requires good bike handling skills. Speed can be your friend here. I did not take many pictures from through this section but you can see most of it in the video. The terrain continues to change the further down you go. 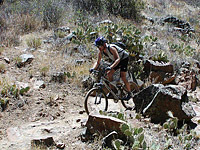 Before too long you leave the chaparral and find yourself in desert scrub. 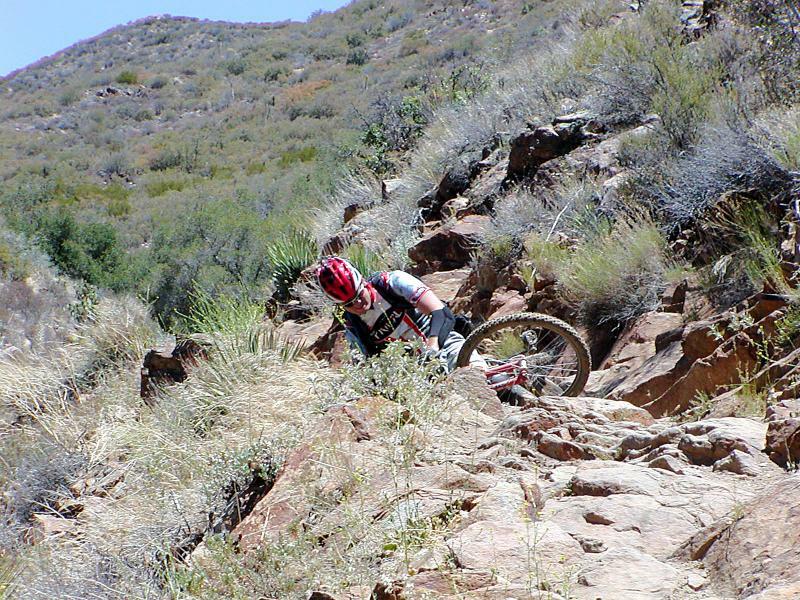 The trail is very narrow with the penalty for failure being quite steep if you screw up. No macho pride here for me, I had some additional protection on. On one section the trail was really loose and everything sort of slide off the trail to the left and downhill. Collin was a head of me and it tripped him up. I saw it happening and tried to make a last second change of lines. Well I did not pull it off and found myself sliding down the side of the hill. Somehow I had managed to get my leg tangled up in my frame. I also could not move much without sliding down the for Lord knows how far. Lucky for me my Homeez were there to get me untangled and back up on the trail. 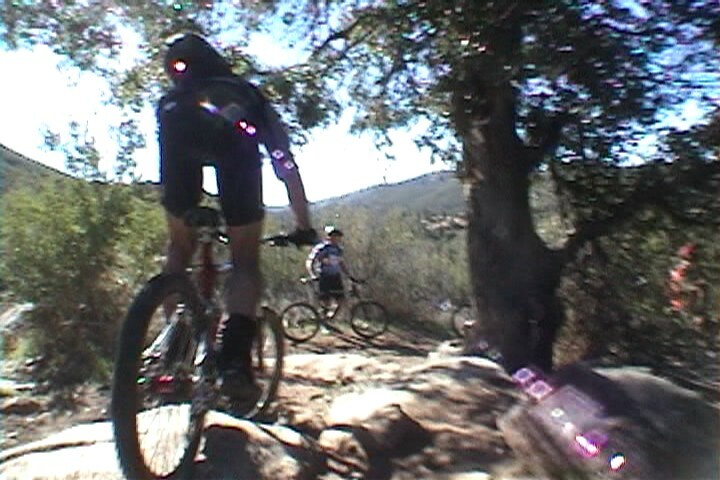 Somewhere further down the trail I managed to shake my battery loose from the camcorder so the video did not capture some of the other truly gnarly sections. One such section is know as the the "Stairway to Hell". There is no "line" per se through this section. Just a bunch of rocks all over the place. Speed and good weight transfers are the name of the game here. My extra protection more that paid for itself (again) by the time I got through this section. After spending good bit of time in this section we continued along down the trail. There is an very obvious trail near the bottom peels off to the left as the main trail makes are right hand turn. 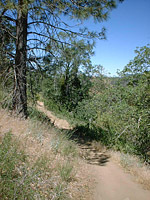 There is a sign that annotates that the main trail is Noble Canyon and goes to Pine Creek Picnic Area. The trail to the left heads into Pine Valley and it was smooth with some short gradual climbs. It ultimately dumped onto a paved residential street. I don't remember the exact streets but if your are heading down hill it will all come out the main drag of this little hamlet where the General Store is one of the center pieces. 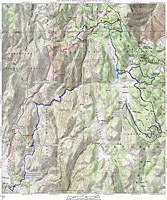 This route is somewhere around 11-12 miles. 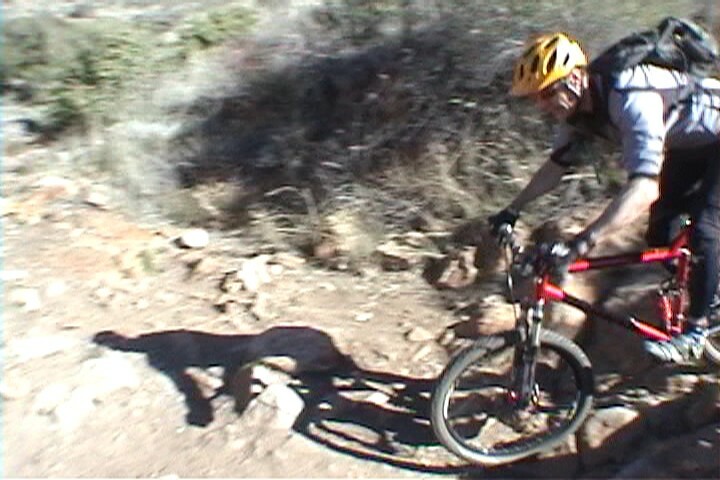 I did the the climb up from the bottom trailhead route for the first time recently (January 17th, 2004). From the lower trailhead you can either go back to the road you came in on and start up Pine Creek Road or you can ride up the trail. If you are into the challenge of some technical climbing I recommend taking the trail up. 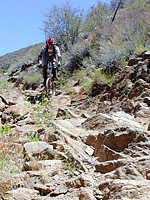 You will have a 1 mile climb up to a saddle and there are some very technical spots to navigate. 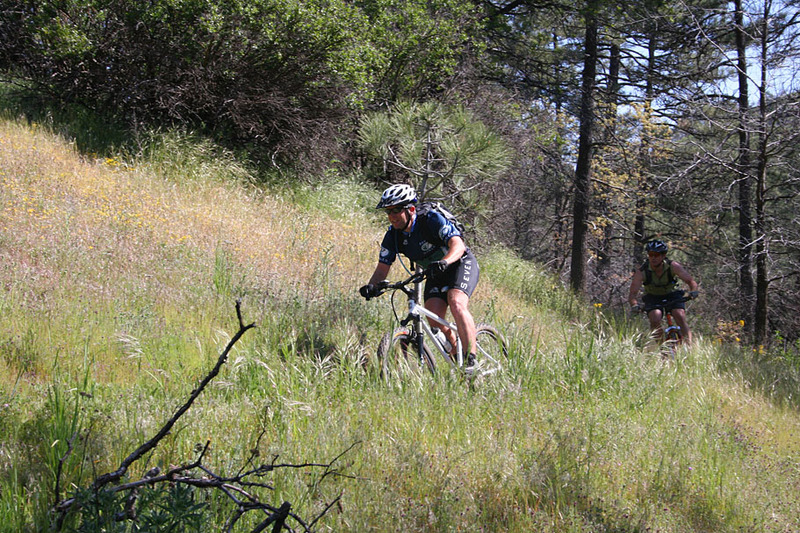 After this main section of climbing you get to enjoy a fun downhill section. 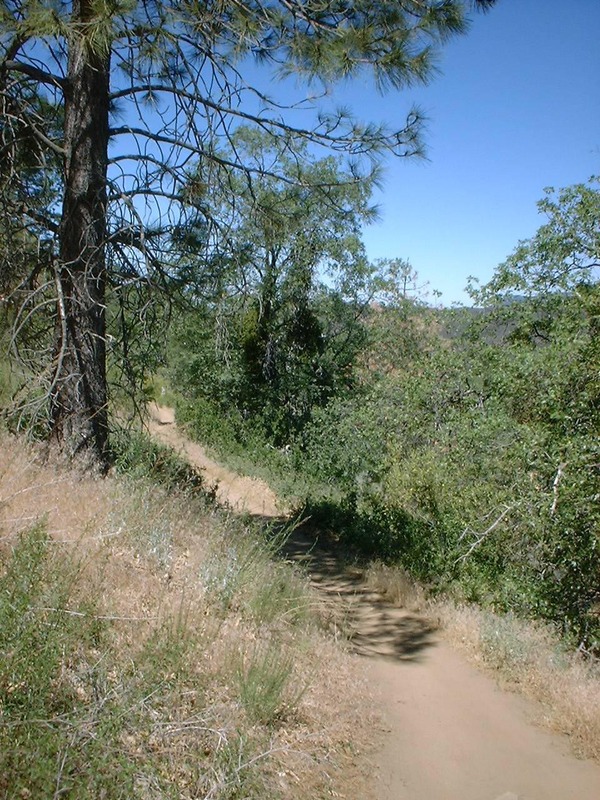 At around 2.5 miles, the Noble Canyon trail makes a very distinct switchback turn. There is also a trail that shoots off the the west that will quickly take you to Pine Creek Road. We took this trail and then continued up Pine Creek Road. From here it is a 2.2 mile climb up 950 feet to the junction of Pine Creek Road and Laguna Meadow Road. 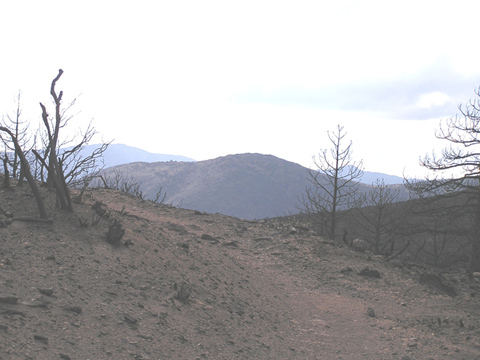 Here you could clearly see much of the burn area, particularly the Indian Creek trail cutting across the hills to the north. From we continued on 2.2 more miles up the paved Laguna Meadow Road. 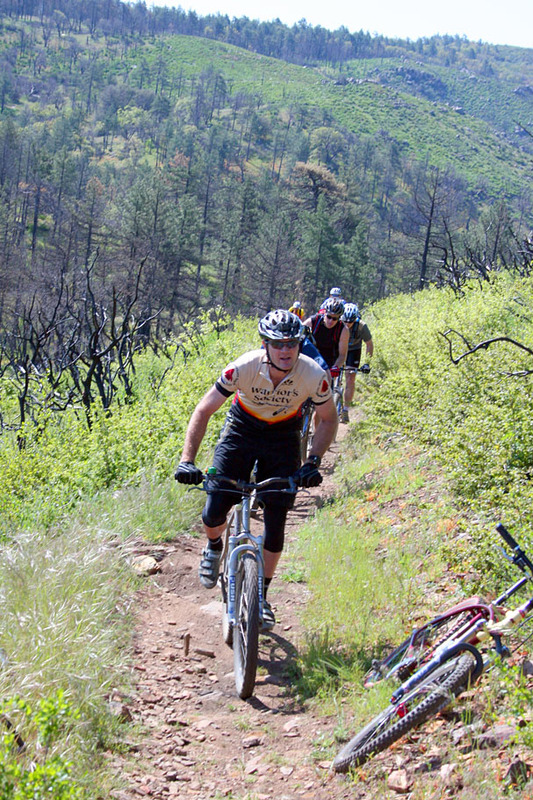 It is not all an uphill grind like Pine Creek Road. You end up going up roughly going up 800 feet and down 300 feet before you get to where the Noble Canyon trail cross the road. 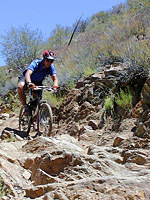 From here you will hang a right and enough the downhill technical goodness that Noble Canyon is renowned for. You never know who you may run into on this trail. Here is two-time XC NORBA Champ Jimena Florit out "playing" with the guys. She totally schooled us all while not even appearing to break a sweat. The view from the lower portions of Noble looking back up towards the Laguna Mountains on July 31st,2005. 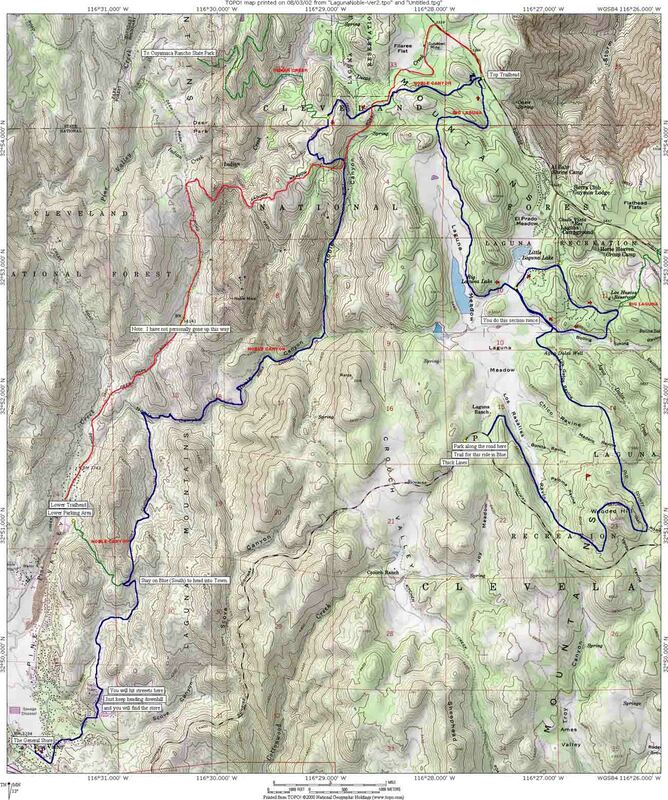 Here is the map and elevation profile for the Laguna to Noble Canyon version of this ride. Hazards: This place is hot in the summer. 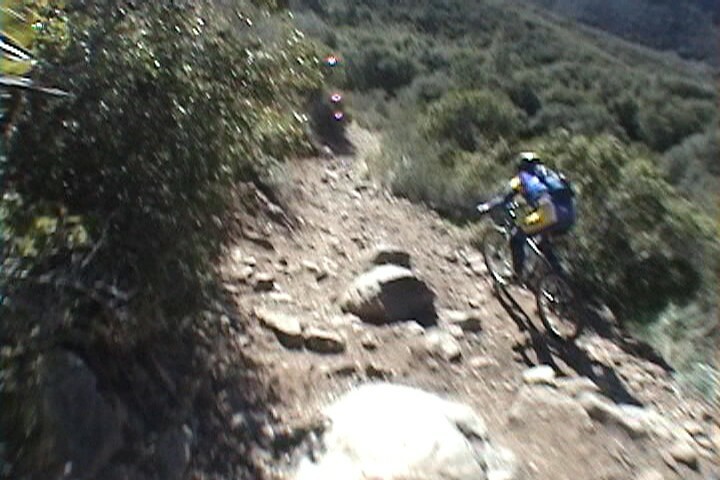 Technical single track with some very nasty rocks all over the place. Directions: From San Diego, take I-8 east 45 miles to the off ramp for Pine Valley. Exit the highway and turn left. Travel north for .3 miles to Old Highway 80. Turn right and travel about .3 miles and you will see the General Store on your left. Park the shuttle car in the parking lot. With the other vehicle, continue on east on Old Highway 80 to the intersection on Sunrise Highway. Turn left onto Sunrise Highway and go up the mountain. About 1/2 mile after entering the Laguna Recreation Area you will see a Wildlife Information Kiosk off the right side of the road. Park somewhere along the side of the road here. 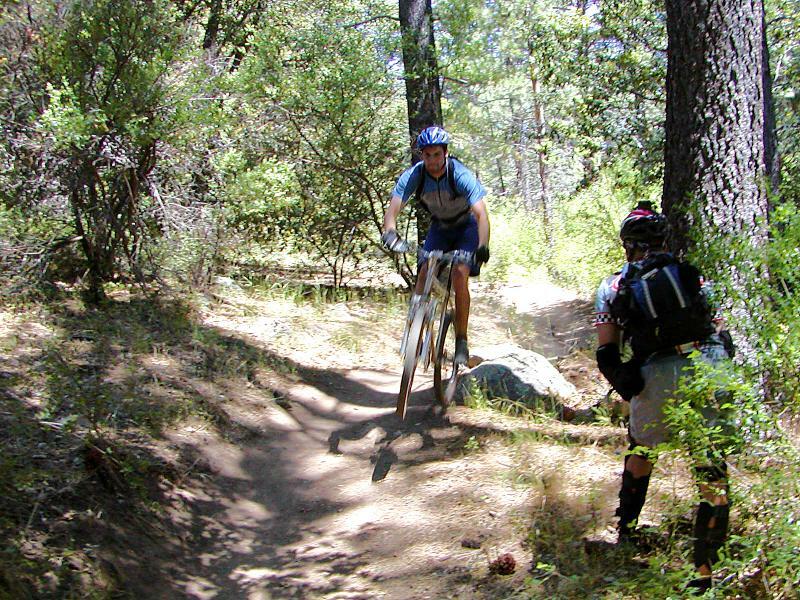 Do the Laguna Mountain Recreation area ride to the Noble Canyon trailhead. Instead of coming back go down Noble Canyon. 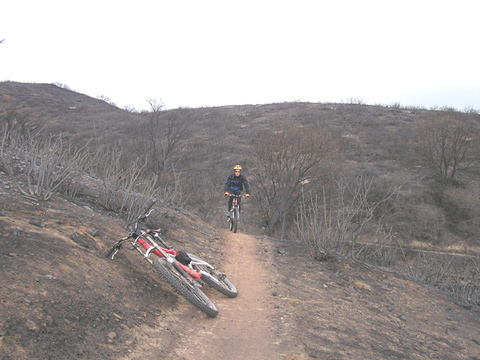 The 2003 San Diego wildfires devastated some our best trails. The upper portion of Noble Canyon was heavily damaged by the fire. 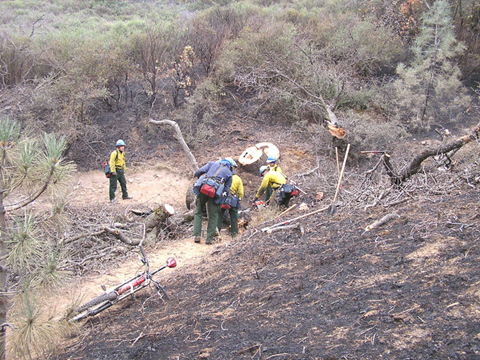 A fire crew from the Tahoe area doing mop up, they kindly offered to remove debris from the trail. These guys rock! 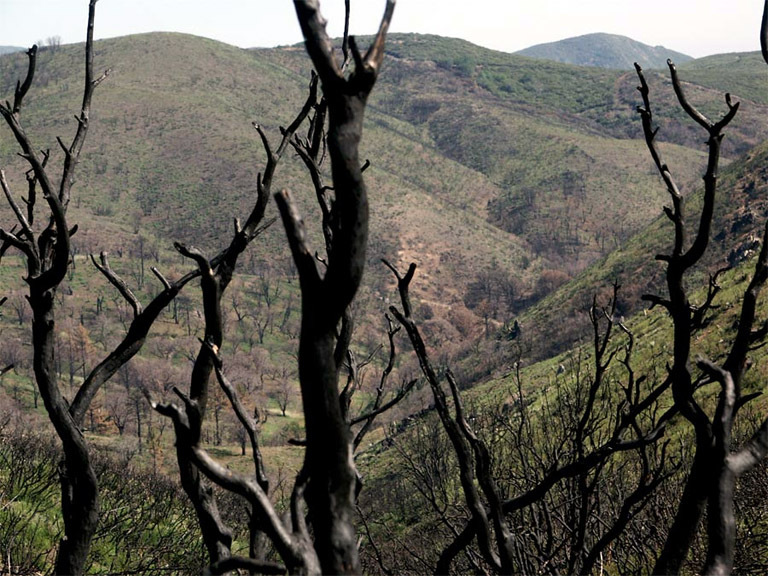 This picture was taken by WINSTON (MTBR.com Handle) in June of 2004 and shows that the upper portion of Noble Canyon is recovering. 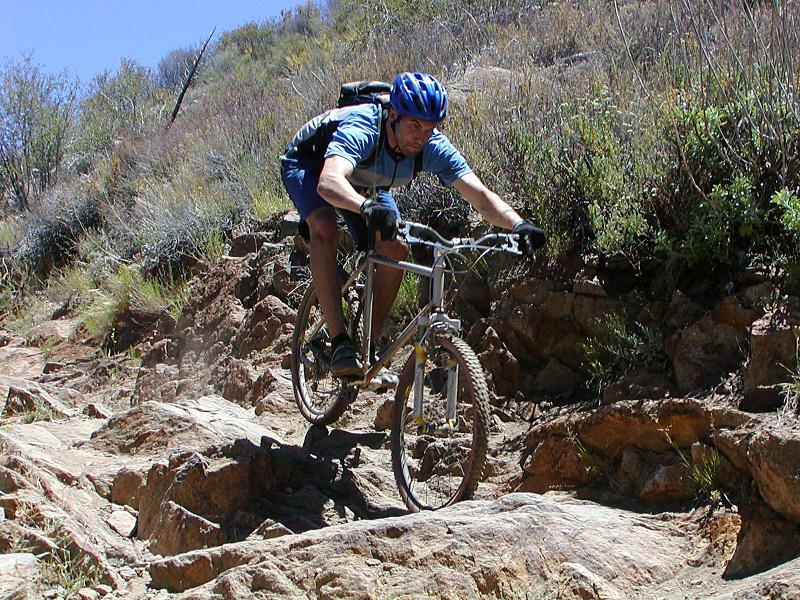 A few pictures from the 2005 Spring SoCal Single Speed Summit showing the ongoing recovery.